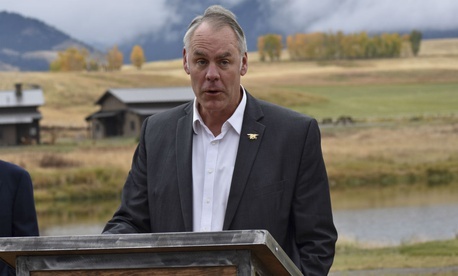 Several media outlets on Tuesday reported that the Interior Department’s inspector general has referred cases involving Secretary Ryan Zinke’s alleged misconduct to the Justice Department. Though no agency has officially confirmed such a move toward a probe of possible criminal violations, the timing suggests that the intensified scrutiny of Zinke’s travel, political activities and certain policy decisions could have been related to the recently aborted attempt to replace the current acting Interior watchdog. The Hill on Wednesday linked the timing of the referral to Justice as “just days before” the inaccurate email sent to Housing and Urban Development staff by HUD Secretary Ben Carson announcing that HUD administrator and human resources specialist Suzanne Israel Tufts would be replacing current acting Interior IG Mary Kendall. Kendall, a deputy IG, remains in the job, and Tufts has resigned from HUD. An Interior IG spokeswoman reiterated to Government Executive that her office won’t be commenting on an ongoing investigation. The Justice Department also would not comment.